If you look at the streets or places in Google Maps, you would wonder when these images would have captured by the satellites. Unfortunately, Google Maps doesn’t show the details of date of the satellite images shown in the maps. But there is a way out to find the date of capture of satellite images of Google Maps. You can get the map image capture information from Google Earth. To find these details, you need to download and install Google Earth. After installation, search for the same place you want to find the satellite image capture date in Google Earth. Navigate to the bottom part of the Google Earth you will find the “Imagery Date”, the date on which satellite took the map image. Minimize the Tour Guide ribbon, this might mark the Imagery Date. 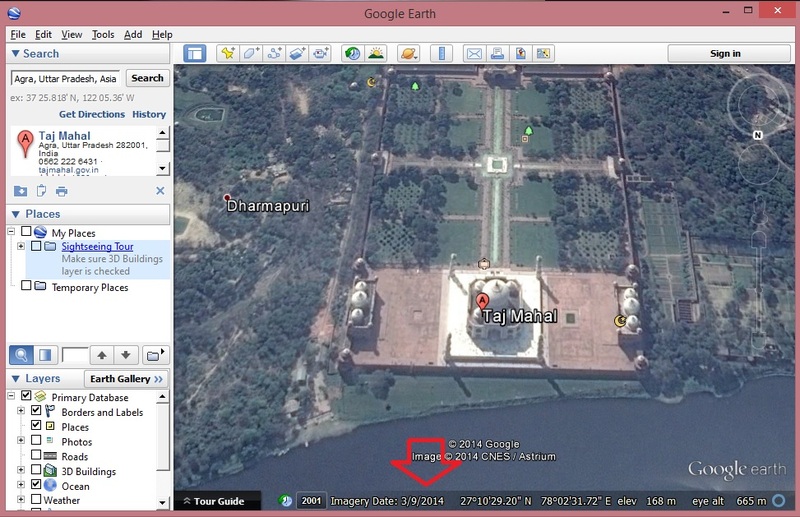 The screenshot of Taj Mahal in Google Earth is shown below, with the date of satellite image capture. How Google map displays dates on their historiacal imagery please solution find and send solution my email-id..